I always find the icosahedron the most difficult polyhedron to assemble with modular tiles. It is so close to spherical that the angles make assembly difficult; putting something together on one side tends to dislodge something on the other side. If you've ever assembled modular origami polyhedra then you know what I mean. It's possible with the compact Poly-Snaps we've been using over the past few posts, but the result it not that pretty. 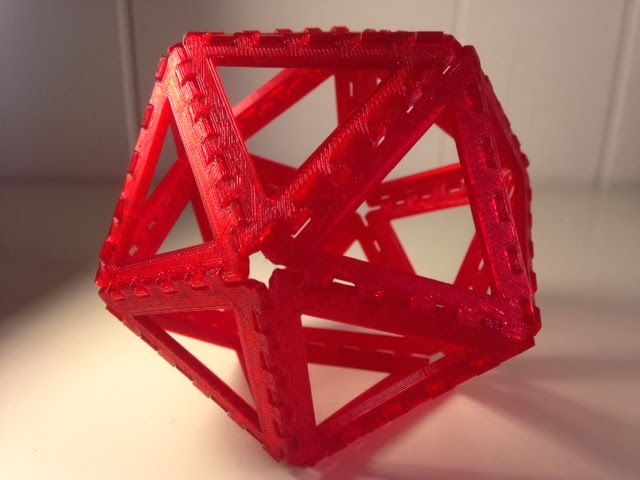 After much trial and error we finally found a lighter, larger style of Poly-Snaps that easily makes an icosahedron without hurting your hands or requiring pliers to put together, yet stays together well until you want it to come apart. The key to the stability is the fact that the tiles have five snaps on each side instead of three. For a dynamic classroom setting I think these lighter tiles would work very well. Technical notes: These lighter, larger tiles were made with the Poly-Snap Customizer settings below.